Atlanta -- SCTE Cable-Tec Expo -- Forget about the much-ballyhooed promise of 5G wireless technology and focus instead on cable's potential to deliver 10-Gig broadband service. That was the message delivered here Tuesday by three top cable industry officials. Speaking at cable's big annual tech show, National Cable & Telecommunications Association (NCTA) President and CEO Michael Powell, CableLabs President and CEO Phil McKinney and Cox Communications Inc. CTO Kevin Hart took potshots at 5G, terming it largely wireless industry "hype" and declaring the superiority of wireline networks. "5G is 25% technology, 75% marketing," Powell said, dismissing the technology as little more than the wireless industry's "latest widget." "You know what the wireless guys like most? Wireline networks," he added, noting that 5G will require backhaul and other services typically provided by cable HFC operators. Paving the way for Powell's remarks with his opening keynote, Hart got in his own licks as well with a tongue-in-cheek rebuke of 5G. "You know 5G is going to be great because it’s got 25% more G," he joked. McKinney joined the 5G dissing party, likening the technology to Teligent, the fixed wireless company that he ran two decades ago before leaving for HP. He stressed the hurdles of delivering point-to-point signals in dense major cities and dealing with such sources of interference as trees and fog. "I think 5G is going to have similar issues," he said. Taking a leaf from the late comedian Rodney Dangerfield's book, the three cable executives also complained that their industry gets no respect for all that it has accomplished over the past couple of decades in the broadband space. In particular, they argued that cable should get far more credit for its continuing advances with DOCSIS technology. "No other industry has been as reliably consistent in doing what it says it's going to do, deploying what it says it's going to deploy, as this one," Powell said, drawing applause from the packed general session audience. Home in on the opportunities and challenges facing European cable operators. 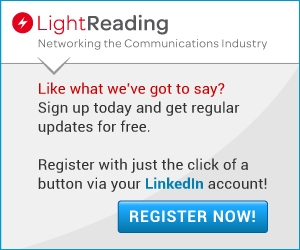 Join Light Reading for the Cable Next-Gen Europe event in London on Nov. 6. Admission is free for all! The NCTA chief contended that the cable industry might actually be acting too humble by not promoting its achievements more aggressively, unlike the wireless and high-tech players. As an example, he pointed to the industry's emerging Full Duplex DOCSIS standard, which will ultimately enable MSOs to offer 10 Git/s symmetrical broadband service. He referred to this new technology as the cable industry's "10G" standard. Pitting in another plug for cable's tech prowess during the general session, Cox President Pat Esser said his company alone would spend $10 billion over the next five years on network infrastructure upgrades.